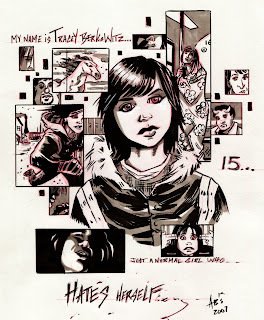 this was the concept design for a comic I'm doing for Director Bruce McDonalds new film The Tracey Fragments staring Ellen Page who played Kitty Pride in X-men. This film is wonderfully experimental and the comic will adapt film elements mixed with sements of the novel by Maureen Medved. The comic will be handed out while going into the film. Hope you guys like. It will be my most experimental work yet. you can view the trailer on youtube just type in the tracey fragments and it will pop up!!! I hope I get to see that movie. The drawing is great. Incidentally, I just showed it to a teenage girl and she liked it and asked who made it.